Tall Chess might as well have been called “LetterChess:” it’s like a cross between the amazingly addictive Letterpress and actual, you know, chess. It’s an iPhone 5 game (hence the “tall” part – it uses the whole of the iPhone’s screen to show the board), and it lets you play the great game against folks you’ll find on Game Center. Why hasn’t somebody done this before? 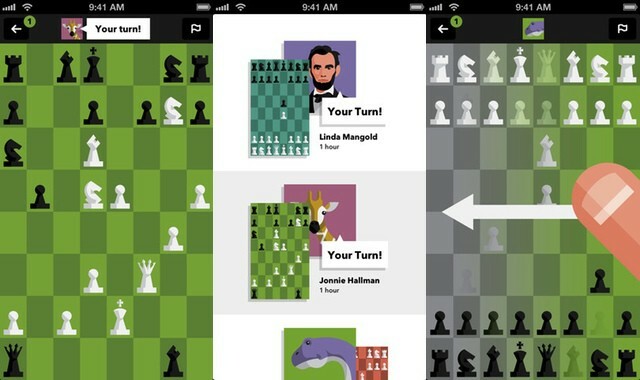 A Game Center-powered chess game that lets you play against real humans. Maybe somebody did and we missed it because it didn’t look as fantastic as Tall Chess. The app lets you play against friends or auto-matched foes, lets you review the last move or the whole game with a swipe, and you can export your games in algebraic notation. The app is free, and you can pay $3 to upgrade to multiple games and customizable boards and pieces. Let’s just mention those pieces a second. The graphics are lovely, kind of what pixel art would look like if the pixels were smoothed off instead of all jaggy. And the icon is a giraffe wearing a crown, which pretty much makes me love the game. I also love chess, but I don’t like playing against the computer as I never feel that I can lose: I can just dump the game if I get too far behind. I guess that there will still be a whole bunch of morons who do this, just like they do in Letterpress (what can I say? My opening Letterpress moves are often formidable). Still, I’m going to give it a try. I’m Mistercharlie on Game Center if you want to play.